Please post all discussions/feedback/additions/etc. for the FORTHCOMING Gemstone Mining Guide here. Trying to keep the guide thread clean, for easy reading/referencing. This does make feedback slightly trickier... I will amalgamate the feedback from here into the guide. If applicable (it's not yet, cuz it doesn't exist yet) please also include a link to, or quote from, the section of the guide you're responding to. Last edited by Coda; 02-11-2018, 12:15 AM. I have made decent progress collecting "new" data since version 1.2.88 went live. So far I have tested several Story Mode levels, and wanted to share the initial results. Last edited by Coda; 02-10-2018, 01:10 AM. If applicable (it won't be yet, cuz it doesn't exist yet) please also include a link to, or quote from, the section of the guide you're responding to. As you probably already noticed, when you post the guide, lock it and put as little into the first post as possible. When it gets move into the GUIDES section, changes to the first post tends to trigger the "spam alert", which then locks the thread and need admin approval. You're free to edit/add new replies to it as much as you want, just not the very first post of the thread - at least that's what I've seen with the Jewelry guide. In the data collection definition you said you were going to record gems but I don't see that in the table. Are these runs mobile or PC? Doesn't matter if you're the only one recording data but if others add in it will an important factor to compare. I would also include trials before coming to a final conclusion in case clearing a trial in 1.5 minute ends up more efficient. Part of that would be confirming whether there are more gems dropped in higher trials; if not you could safely pick a super low trial. I'll help gather data when I have time; it will be PC and I can do BH or mage, whichever would be more helpful. adjacentengels so far all is mobile. PC v.88 only came out just a bit ago. Agree that is a variable to consider. I have data on gems, and some results ARE posted above. Re-read the tables please. The main point of mining is gemSTONES but Gems will be included. Trials data is forthcoming; agree on that point for sure. Collect data per the above. BH is needed most of all. Nhat thanks much for the tips. Keep 'em coming. I have data on gems, and some results ARE posted above. Re-read the tables please. Maybe there is a display issue since I'm viewing this on my phone, but the only place gems are mentioned in the results is that you are 100% confident that Legendary is better per run and per min (no numbers that I can see). I'll check back when I'm on my laptop. That's all there is so far. But this is gemSTONE mining not GEM mining. So that will be the focus. So should we actually include gem differences between the difficulties? Is it a useful data point to include? I suppose if a person's gear is strong enough to handle legendary broken dragon in roughly 60 Seconds, extra gems are a nice bonus. I will include the results for gems, when I have enough data. The numbers are a lot smaller so need a lot more runs to pool together to do statistics. At the moment the level vs level data, if I were to list it, would be unreliable and possibly misleading..
One section of the guide will be 'strategies' ... not which level but how to run the level for best mining. Would like to get everyone's input!! I have a hypothesis that #3 is best for a mid to high level mage. Let's see what the data says after I collect it. Going to re-test the top 2 levels, SoA and TBD. This is the first time I have ever posted to a forum of any kind so please forgive any breaches in etiquett or protocal. I have a LvL70 Mage, Champion 318. So far in the Story mode, I have collected the most gemstones from The Crucible of Mawrth, The Temple, and TBD, respectively, all on Legendary. In Trials mode, I was able to complete the 100 gemstone milestone for Carnival using just one 200% currency booster. I collected 158 gemstones running the same 3 Trials (Trial 37, 40, and 43...I chose those because the Boss is TBD and this seems to be the easiest boss to defeat with the mage). I was clearing those trials in about 3-4 minutes and collected an average of 30 gemstones per run. I don't know how these numbers compare to other players and I'm only sharing them in order to provide input for the guide. Time for an update. Following the methodology above, I've completed the 'Trials' portion of the data collection, for MAGE. Here's the STILL PRELIMINARY results, with a few observations. By the way, to minimize confusion I am going to start calling gemstones = STONES and gems = GEMS. Which Level should I play? STONES -- TBD, a Trial around #30 (26-34), and SoA have the lead. GOLD -- a Trial around #30 (26-34), LJ, and TBD have the lead. I am planning to re-run SoA where I kill more of the mobs, those I can kill along a direct route causing minimal change in time duration, which is expected improve the gold from SoA. You also sometimes get stones and (rarely) gems from mobs. I'll re-run an equal number of TBD and Trial 30. Why does SoA get a second chance? Lots of folks have intuition that it should replace SM as the best. It is reasonably short, and the path is straight north. Yay, cuz having to go south like in TCoM really stinks. And the boss is one of the 3 Trials bosses. And it is the same boss that we miss so dearly from SM. If you read the newb guide, certain levels are suggested for Gold & XP and this is one of them. It is 'enemy dense' and has linear path, although it is annoyingly winding for a Mage running Blink. Some of the other levels were chosen for similar reasons. Read the older gemstone guide from before the SM 'bug' was discovered. If you have a different favorite level, comment below as to why! It is likely LJ will not receive much further attention from yours truly, because TBD is nearly as good as LJ in gold (in fact, statistically, we are not confident that LJ is better) and TBD far surpasses LJ in stones, and gold is not the focus. Is it OK to play "Normal" -- is it as good as "Legendary"? Should I play Trials or Story? 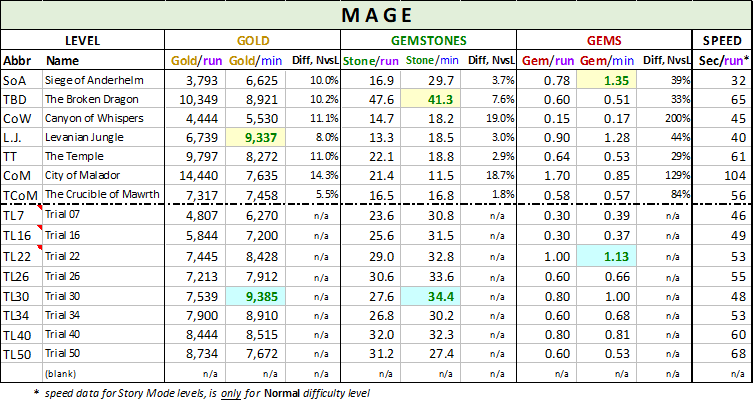 TBD has a decent lead in stones and is roughly tied with TL~30 for gold, based on the MAGE data collected so far. However, SoA might turn out better for a Bounty Hunter. Or Warrior. And I haven't yet tested "no companions"... etc. In Trials Mode, you don't get any gold from mobs. If you have advertisements turned off, those hovering boxes give a tiny amount of gold -- or extremely rarely, a gem or a piece of gear -- but you have to pause for a moment, ensure combat is disengaged and tap on the tiny thing. Other than that, you are selling the always and only 3 pieces gear, which improve in quality and thus value as the Trials get harder. Same as Story Mode, this only works to a point, on a per minute basis, because of the longer time it takes to do harder trials. Note -- the tie might get broken by XP --- Trial #30 will give you about 3x more Experience than TBD / Normal / Level 70. If stones aren't too much lower than TBD (or whichever Story Mode level is best), it might be a good compromise. Which Trial is best for me? The optimum Trial level seems to be about where you can still one-shot non-Elites, but it takes a brief half-second or so to take out a small group of Elites, and the boss takes 1 to 3 seconds. I found a decent range where my results were pretty similar. Remember there is map variability so there will be data variability. In Trials Mode, you don't get any gold from mobs. If you have advertisements turned off, those hovering boxes give a tiny amount of gold -- or extremely rarely, a gem or a piece of gear -- but you have to pause for a moment, ensure combat is disengaged and tap on the tiny thing. Other than that, you are selling the always and only 3 pieces gear, which improve in quality and thus value as the Trials get harder. Same as before this only works to a point, on a per minute basis, because of the longer time it takes to do harder trials. Collect your own data and compare, or I'll send you the Excel file that'll help you analyze it. Why no comments on GEMS? The numbers are small in magnitude so it's harder to be sure of differences, if any. I doubt many people would mine stones in a sub-optimal manner, in favor of gems. You don't get enough to make the time worth it. People asked for the data so it's now included. Last edited by Coda; 02-10-2018, 11:52 PM. Here's a link to the Excel file I've been using if you want to have a look, or enter your own data. Mine is in there so you'll have to delete some or all of it to make room for your own. Since the devs blew up Severed Mountain (formerly known as the Gemstone Mine), I decided to do a little real-world research on gathering gemstones on other levels. Now, I’m no Coda. Coda is awesome, by the way... but I still want to share a little data for those who might want to see my un-scientific results. First - I only play on mobile. Second - These results are from a Bounty Hunter in a 6/6 Assault set. Third - Every run was Zerg’d. That is a rush to the boss as fast as possible, only eliminating necessary trash mobs. Fourth - Each run was done on Normal mode. Fifth - No companions were used. Sixth - I didn’t keep track of any other drops, gems, or gold. Seventh - I didn’t count the number of runs, or time them. FINALLY - The runs were all played with a Greater Currency Booster, and limited to 30 minutes each. All gemstone numbers are shown in “rough” condition to keep it simple. Abandoning the Siege of Anderhelm immediately after looting the boss gave me the best results. Friend me if you’d like!